link love | live. laugh. love. There’s not much that’s very elegant about my life. And really? That’s just fine. I’m a jeans and t-shirt kind of girl. Pizza and beer are a great date night in my book. My floors are unswept and there are always dirty dishes in my sink. As much as I like candles, they rarely get lit around here and our mouths and hands are wiped with paper napkins, not cloth (much to the chagrin of my inner treehugger.) Also, I rock out to the Dixie Chicks when I do get around to cleaning. But every now and then I like to refine things a little and experience a bit of elegance in my life. I’ll light those candles, chose wine over beer, put on a skirt and heels. And elegance can definitely be found in housecleaning when you’re listening to Joshua Bell. When I received Bell’s new album, At Home With Friends, I was blown away by it. I think my Facebook status the first day I listened to it was something like, “Joshua Bell’s new album is intoxicating. I just want to melt into the floor and listen to it forever.” A few days later, I put it in the CD player while I cleaned the kitchen and all of sudden I felt elegant and intelligent and enlightened all while up to my elbows in hot water and suds. I’ve always enjoyed collaboration albums and At Home With Friends does not disappoint. My favorite? “Come Again” with Sting. I will listen to that one over and over again when I’m alone in the car. Oh, which reminds me of another bonus point this album gets. I listen to it when I’m alone in the car. You see, once my children exit the car and all their noise leaves with them, I’m usually loathe to turn on the radio or put in a CD. I like the quiet because I get so little of it while they are awake. So to have found music I willingly turn on during my precious “quiet time” is a very high compliment! The star power on this album is definitely breathtaking; in addition to Sting there’s Josh Groban, Kristin Chenoweth, Regina Spektor (the previously unrecorded, fan favorite, “Left Hand Song” is on this album! ), Marvin Hamlisch, Frankie Moreno and many more. The amount of talent on this album is absolutely mind boggling. The other really big bonus for this album is that DB also likes it! He and I both love music but our tastes don’t often overlap. (A previous overlap, courtesy of One2One, was Diane Birch. It surprised but delighted me that he liked that album, too!) Knowing that when I turn on At Home With Friends to listen to while doing housework or unwinding, he won’t cringe (like he does when I choose Norah Jones) makes listening to this music that much sweeter. If you’d like to add a bit of refinement and elegance into your life, I definitely recommend this album. I, in fact, am hoping to add more of Bell’s work to my repertoire of housecleaning music! At Home With Friends is available for purchase online and in stores. In my less than stellar moments as a parent, I wallow in being unappreciated. Don’t my children know what I do for them? Don’t they realize that without me these things wouldn’t get done? Why must I tell them to pick up their shoes everyday and why must I answer the same questions over and over again? I have to be careful and not let selfishness get the best of me. Living in the messy, exhausting day to day of life often robs me of perspective. They don’t need to see how they are blessed by me, I need to see how I am blessed by them. They are awesome. They take my breath away. They are precious and perfect and they bring such joy and happiness to my life. Remembering that is what brings me to tears every time I hear the song “Ghandi/Buddha” on Kenny Loggins‘s new album, All Join In. While I disagree with the theology behind the song (past life karma), the sentiment of our children being so wonderful and getting to have them in our lives is a powerful message. A few of weeks ago, One2One Network provided me with a pre-release copy of Loggins’s new album in exchange for giving them feedback. When I took their survey, they asked if I’d like to be able to offer downloads of songs to my readers. And guess what? I get to offer you downloads for 4 songs from the All Join In album! In addition to “Ghandi/Buddha”, you can get “All Together Now”, “There Is A Mountain” and “Your Lollipop”. All Join In is a new children’s album from Kenny Loggins. But you know what? You’ll like it as much, if not more, than your kids! I keep this CD in my car and play it often. GMan especially enjoys it and has specifically requested that I play it. So how do you get the songs? It’s fairly simple. Follow this link. Listen to the songs, answer a short survey and an e-mail will be sent to you with a link for the downloads. I hope you enjoy the songs! I have mixed emotions about everything from salad dressing to politics. I see just about everything from at least two sides. I agonize over what I’m going to wear, what I’m going to fix for dinner and which color polish to put on my toes. Too often I second guess myself. Parenting is complete insanity for me because I feel like I’m being either too overprotective or too laissez faire. My life seems to have very little “middle ground”. Which is why I sit here simultaneously wishing I was at BlogHer ’09 and being glad that I’m not. On one hand…it would be superbly fabulous to get to see my blogging buddies again, attend parties with peeps, get sweet swag and oh, maybe even sit in on a session or six. On the other hand…being home right now with the responsibilities that life has handed me is really the best choice. But I know I’m not alone, which is why I’m BlogHoppin’ and gettin’ together with some fellow Nashville area bloggers, who also did not got to Chicago this weekend, for some face time and margaritas. If you’re here because you’re BlogHoppin’, welcome to my madness! My most favorite thing about blogging is meeting new people! I also hang out on Twitter (ahem, a lot), if you’re so inclined, leave your Twitter handle in your comment. 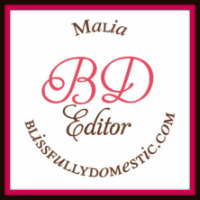 (I’m @justmalia and @wedblissfully!) If you’re a local yokel, some of us lady blogger types are gettin’ our guac on at Cantina Laredo tomorrow night. Hope to see you there! And there’s also this other, smaller but just as fabulous conference know as Type-A Mom Conference coming up in September. It will be in Asheville, NC (great city!) and I’m making plans to attend! Will you also be at Type-A Con? To my friends who are at BlogHer, I sincerely hope you’re having the time of your lives. Have fun, soak it all in, and take lots of pictures! Here’s hoping that next year, I’ll be joining you! We’re a little over a month into our CSA season. I am getting better about either using or giving away the produce that we get each week. It’s quite a challenge because right now, in the midst of the growing season, our weekly “share” seems to get bigger each week! Unfortunately, there’s a lot coming through that our family just isn’t interested in. Beets and celery mainly. And I keep getting these good sized onions as well. I use onion, just not that much! Fortunately, onion keeps pretty well for awhile. I’ve used some spearmint to make a yummy fruit tea that received rave reviews and some bibb lettuce to make a salad that David and I devoured. Bibb lettuce, bacon, boiled egg and homemade blue cheese dressing. (Tonguegasmic as we like to say!) I’ve also done a Leek-y Chicken skillet dish (a Rachael Ray recipe) using leeks that we received. I have more leeks and will be repeating that dish since it was fairly well received by the family. (I make an alternate “chicken” dish for JBelle and GMan ends up just eating the chicken and pushing the leeks around his plate. lol) I got more rhubarb last week and made another upside down cake for the 4th of July. My sister-in-law, who grew up eating rhubarb delicacies, thought it was delicious! We got 3 cucumbers that would be perfect for pickling, so we need to find a fairly simple recipe for pickling so that those can be used as well. We get carrots fairly often, too. They’re small but pretty tasty. I never got around to taking a picture of the final product. Oops! Edited: I was having some difficulty with the widget yesterday and didn’t realize this had posted without any content! Oops! I have two reasons for posting this. 1. I really, really, really, really, really, like this music. Really. I’m not exactly the most fluent music critic (obviously), I just know what I like. I can’t exactly describe to you what I like about this music and this artist, I just feel it in me. I feel good listening to her music. I get her songs stuck in my head and instead of it being annoying, it’s satisfying. I relate to her lyrics. I enjoy the mixture of styles she employs to create her own unique sound. It’s good music, plain and simple. 2. It’s for a good cause. If you like this music too and are compelled to add it to your collection, would you please consider clicking on that widget up there and buying it through that service? For every album purchased through one of those widgets, $1 will be donated to charity. As you can see, I picked the March of Dimes. You can purchase through either iTunes or Amazon. To find out more about Diane and her debut album, go here. Many thanks to good folks at One2One Network for the opportunity to share this with you! disclaimer: A gratis copy of the album was provided to me. My review of it is from the heart, as is my participation in fundraising efforts.